Dasharajna or the ten kings is a part of Rig Veda, story of a valiant king who defied all odds and won a legendary battle against collective mammoth armies of 9 king of Bharatkhanda . India’s very own 300 but unlike Spartans they lived to tell the tale. Initial setup and descriptions were bit lengthy but necessary for the story arc. Kusa fields, Uttanga Mountain, Parsuni River and even the animals, all of them played a significant role in the story. Ten Kings is fast paced account of just one day of righteous king Sudas’ life. How clouds of gruesome battle hovered over his clan and how he snatched almost impossible victory from the jaws of his enemies and laid down the foundation of one of the most advanced civilization of ancient India at Harappa. 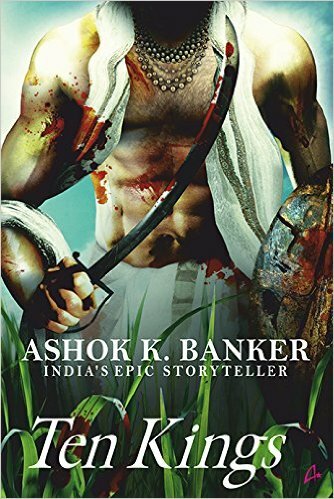 Ashok Banker is a master story teller and with his impeccable grip on english language he spun beautiful tale out of Rig veda. With King Sudas, enigmatic Guru Vashishta and fearless warriors of Trstu clan he created a vivid picture of land of five rivers.